1. This particular doll is in the same skin tone as the purple top Made to Move from the first release. That doll has become “rare” apparently, so this curvy one is a nice alternative. 2. All points of articulation functioned perfectly. 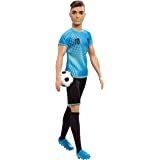 I have read that there are some defects on these dolls where the arms don’t rest at their arm joint properly. This is not the case with mine; but it’s worth pointing out for any potential buyers. 3. The yoga fashion is really nicely executed. Love the versatility in the flower patterned pants, and that the top has velcro at the back. 4: She has really nice hair quality and color. 1. These dolls are prone to having really bad facepaint and wonky eyes. Not an issue for me since I’m interested solely in the bodies: but for those that do care I’d suggest buying her in store so you can pick one with the best facepaint. 5.0 颗星，最多 5 颗星Love this body so much! 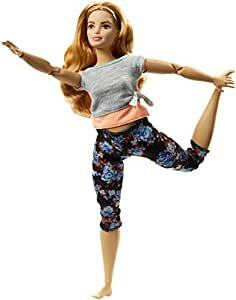 The Barbie Made to Moves have some of the highest number of joints in any play doll -- 22 points of articulation! I thought Mattel couldn't top that, but the curvy MTM body is amazing. It's genuinely curvy, with bigger thighs, a little tummy, bigger backside, thicker arms, but still as posable as ever! Now, the downsides -- I own both this and the tanner Dancer doll. In changing their limbs to be curvier, the designers made the joints HUGE. They are not subtle at all. The knees are enormous and really stick out. The elbows also are very obvious and have some issues bending. Sometimes you really have to force to get the arm to bend enough to touch her face! However, despite the joints, I think these dolls are amazing and could be revolutionary for both doll collecting and play. Their posing is superior to some dolls in a much higher price range, the joints are tight (they can hold their hands in the air without them slowly sliiiiding down to their sides), and the curvy body is simply adorable! Definitely recommend. Great doll! Her joints are nice and tight and needed to be worked slowly at first to get them moving--that's a good thing, it means they won't go floppy quickly if played with. This doll is SLIGHTLY bigger in some areas than the non-jointed fashinista curvy dolls, so some clothes may be too tight. Skintone wise, she is very fair. She is the same skintone as the original series curvy doll with blue/black hair, if anyone is looking at her for body swapping purposes.